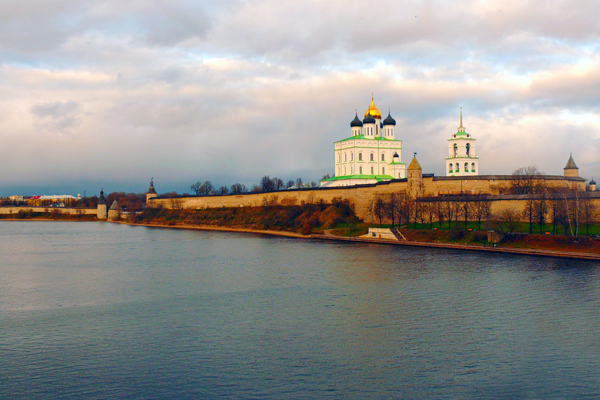 Pskov is one of the most beautiful among all ancient cities of Russia. It is believed to have been founded in the 10th century or possibly even earlier. However the earliest mention is the chronicles of 903 and that year is sometimes taken as the city's foundation date. Pskov lies in the north-western part of Russia almost on the border with Estonia. On the one hand this advantageous geographical position stimulated its development as a crafts and trading centre. It was the departure point for traditional Russian goods such as wax, honey and furs and the entry point of foreign goods into the country. Pskov's merchants were renowned throughout the world for their honesty. On the other hand Pskov became the intercessor of the north-western borders of Russia. This historical past as a warrior city reflected in the architecture and added stunning defensive structures that surprisingly harmonize with cozy orthodox churches and poetic landscapes of the Pskov Region. Today the city boasts a great number of existing historical monuments (over 300) that include fortified walls with towers, churches and monasteries. The earliest ones date back to the 12th century, the latest to the early 20th century. The historic core of Pskov is the inner walled city, uniting the Kremlin (12th -16th cent.) with towers, the Trinity Cathedral, and numerous medieval churches and monasteries. No matter the season Pskov is worth a visit for those who is willing to see the cultural heritage of Russia, witness its centuries-old history and admire its medieval architecture!